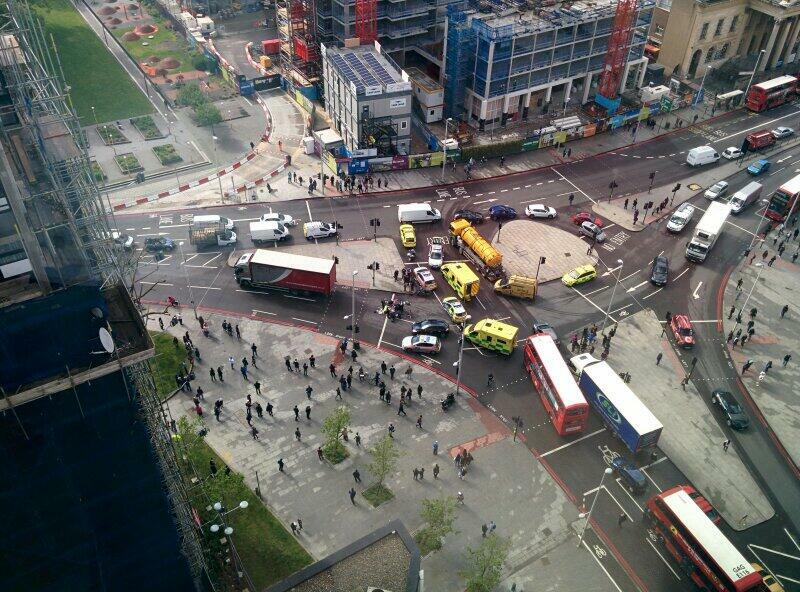 Emergency services attend to a crash at the Elephant and Castle roundabout in London on 13th May 2014. Photo by Nyron Gopeesingh, used with permission. UPDATE: Please see our ‘Thank Yous‘ and ‘media coverage‘ articles..
Where: Outside Strata SE1, Elephant & Castle southern junction, SE1 6EJ, London. Remember: this protest is taking place at the southern intersection, next to the Strata building. 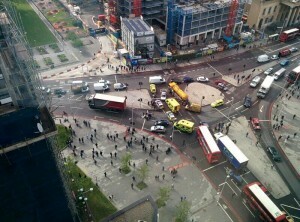 Some family members of those killed and injured may be attending – so we are asking that people treat the event as a dignified peaceful Direct Action expressing our anger but our peaceful determination to get emergency action to protect cyclists and pedestrians asap from Southwark Council and TfL. Approximate timings of the event today – rain or shine. Subject to change depending on situation, weather and media goals. The Die-In may take place before the Rally at 6pm as London Tonight, Evening Standard, Live TV, South London Press and Southwark News have all said they want to cover the event – possibly on their evening broadcast. The police have been very helpful liaising to ensure its safe. NOTE: Timetable may vary slightly from that published. Be there for 5:30p and then you won’t miss a thing! 5:30 Start of “Draw-In” event. 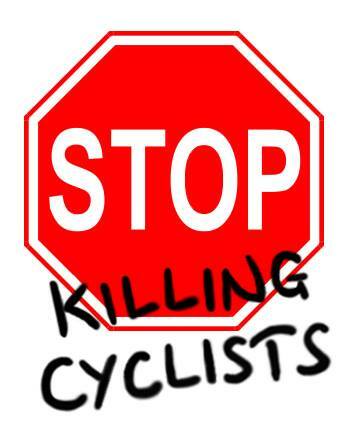 Protesters invited to colour in the cycle route in whatever way they feel moved to -whether images or messages. We must be respectful as the protest is a result of Abdelkhars Lahyani’s terrible death last week. 6:10 Rally – speech by Steve. Poem to be read by Abby. Special message to the protest from Thames Street victim Bart Chan to be read out by Will. Possibly other statements. Note: the date of posting of this article was 14 May; It was changed to 21 so that it appeared at the top of the blog on the day of the protest.